I have been learning my way around shaders, but all this premultiplied alpha business is still going over my head. But the values don't work out the way one might expect. What needs to be done so we basically keep the same alpha of the original image AND change the pixel colors? Ashley (I realise you are very busy, but I really would like to understand the Shader behaviour). I'm attaching the Shader itself for easier testing if necessary. It looks like you need to premultiply by your calculated alpha value M, not the original alpha value from the pixel. Here's an additional demonstration - could it be that either the pixelWidth and pixelHeight values are acting weird or something is equally weird with alpha when a sprite is moved? In theory the sprite gets moved exactly a given amount of pixels - 128 or 64 or so. As we see the effect acts different when a sprite is moved somewhere and then comes back. Any idea why that is? The strangeness happens if there is any other Shader present - it seems as if having a different Shader in the stack also "adds" some extra space around the sprite, even without the expand properties being used - here's the "inline" with a Shader in the stack: http://i.imgur.com/XVNqScz.png - it seems like it is able to "detect" the surrounding pixels and properly mark the inside of the sprite since there's 0 alpha around. 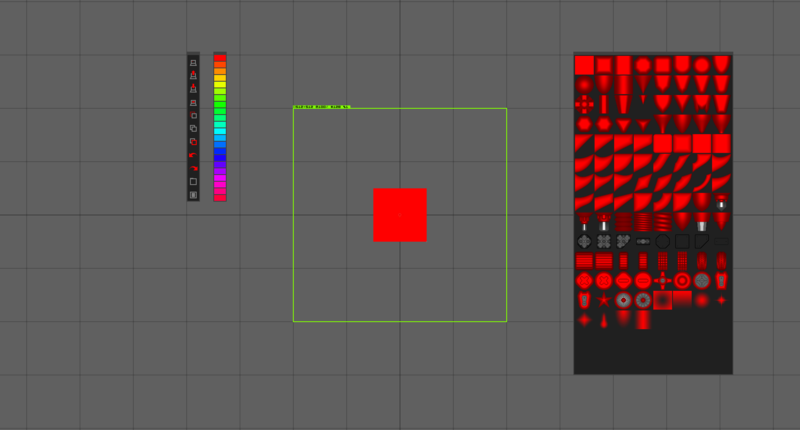 And without any other Shader it looks like this - http://i.imgur.com/LXMbyP5.png - nothing is drawn since, apparently, the Shader cannot read the 0 alpha from outside of the sprite bounds. Looks like subpixel interpolation to me. No way around that. You might see what it looks like in other browsers however. Thanks for the reply - so far I have tested on Chrome/Firefox on two different systems and the weird behaviour is present on both. Will try IE11. Since it uses the PixelWidht and PixelHeight values - is there a slim chance that those get iffy somewhere along the way? You should test on as many WebGL-supporting browsers as possible as your very first port of call. This is all essential information and without that we can only speculate. 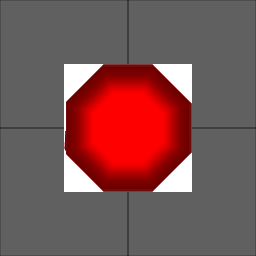 So when sampling outside of the texture bounds, it samples the same border pixel (opaque) like if the texture repeated the border to infinity. This causes the glitches. You can fix this by manually adding a 1px transparent border to your images or extending the effect bounding box in the shader xml. Thanks for the input, Animmaniac, but my question is more about inconsistent behaviour - as you can see in the animated gif - one time you get the effect, move and object away, then back the same amount and the effect is different, move it away again, then back and it's suddenly fragmented. And my images are 254x254 so on export they get the obligatory 1px transparent border (I also just made this image have the border in preview and it's the same). If I use it as the only Shader it works predictably, every time. So, perhaps something is happening with Shader stacking - hopefully it can be addressed. I did some tests but I can't reproduce this inconsistent behavior that you are describing. You can try for yourself here. *I did some modifications to the shader based on what I think you are trying to achieve, but it works the same regardless of the modifications. I left a transparent border in two sides of the images (right and bottom) so it's easy to spot the differences with and without a border. You can see in the image that only the sides with a transparent border are rendered correctly. Also added sine behaviors and a rotate to see what effects non round positions could have. It's possible to see some oscillation on the non-transparent borders of the circle, but nothing on the square. Everything works consistently here, and adding other effects doesn't seem to extend the bounding box. Adding a transparent border or extending the texture through the xml solves the problem on my PC. Are you getting the same results? I'll need to compare what those modifications do. The way it has an outline, but respects the alpha of the insides is great. Thanks! In my case it needs to be at least beyond one other Shader (one that trims things) so, unfortunately, I cannot change the stack order.